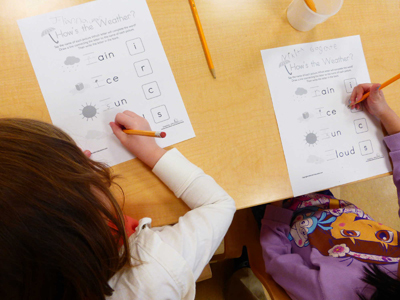 In PreK 4 the emphasis is on number concepts, literacy skills and small muscle activity. The students will work on early literacy, pre math skills, science and journal writing and much more. Students will be provided with opportunities to gain aptitude in a variety of skills and techniques that heighten interest in their environment. As children grow into early childhood, their world will begin to open up. They will become more independent and begin to focus more on adults and children outside of the family. They will want to explore and ask about the things around them even more. Their interactions with family and those around them will help to shape their personality and their own ways of thinking and moving. At this age children are beginning to understand the emotions their feeling, they still has very little control over them. If they find something funny, they’ll laugh hysterically. If something makes them feel sad or angry, they will burst into tears. Your preschooler is also a budding comedian. They are starting to develop a sense of humor, and love being silly and making people laugh. Empathy also begins to emerge around age 4. Four-year-olds are starting to understand that others have feelings, too, and they can relate when a friend is feeling sad or hurt. At this age children’s body movements are becoming more coordinated. They can run more smoothly and stop easily. They also love to hop and skip. They are beginning to throw a ball with some ease and use two hands to catch, missing frequently. They are developing their balance and sense of equilibrium. They enjoy riding tricycles, and pushing and pulling wagons. Their fine motor skills are advancing. They can stack blocks 10 high and string beads. Completing a simple 10-piece puzzle is no longer a frustration but a victory. Coloring, painting, tearing and folding paper intrigue children at this age as they develop increasing control over their fine motor skills. Learn how to solve problems. For example, she may ask another child to trade toys so they can each have a turn. Observe objects with curiosity and notice differences, such as how some rocks are smooth and others are bumpy. Explore cause and effect — shaking a jar of water, for instance, and noticing how it creates bubbles. Practice thinking logically. They will be able to classify objects by size or likeness, for instance, and to recognize patterns. Notice the features of people and animals that make them different.